The golden retriever refused to leave his owner's side after she fainted. In a heartwarming incident, a pet dog refused to leave his owner's side after she fainted on the street - even riding with her in the ambulance. The incident took place in the city of Daqing in Heilongjiang, China, and a video of it viral on Chinese social media earlier this week. 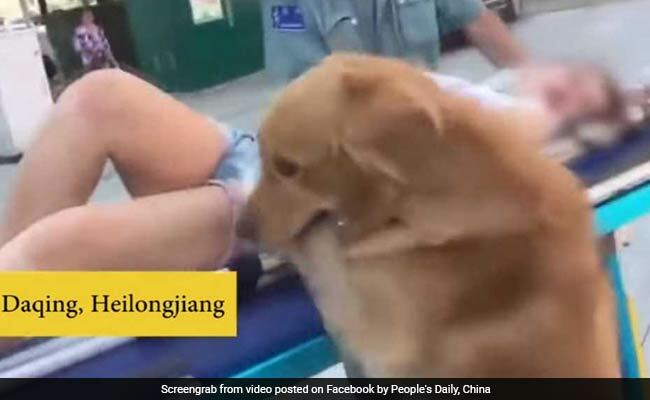 According to the Shanghaiist, the golden retriever refused to leave his owner after she suddenly fainted on a sidewalk. According to a nurse, the dog was circling his owner when paramedics arrived at the scene, and they were worried that he would attack them. However, when they got closer to check on their patient, they realised that the dog was just anxiously waiting for his human to get better. "Under normal circumstances, we do not allow pets into ambulances," explained a doctor surnamed Shao to the Shanghaiist. "However, we could tell that the dog really cared for its master and would help her keep conscious, so we decided to make an exception." Thankfully, the unnamed patient was soon given the all-clear and reunited with her furry friend. "When we saw the patient hug the dog as soon as she woke up we knew we did right bringing it along," said Zhang Jihong, the hospital's head nurse, to South China Morning Post. In July, a video that showed a pet dog pushing his paralysed owner's wheelchair left many on the Internet teary-eyed.